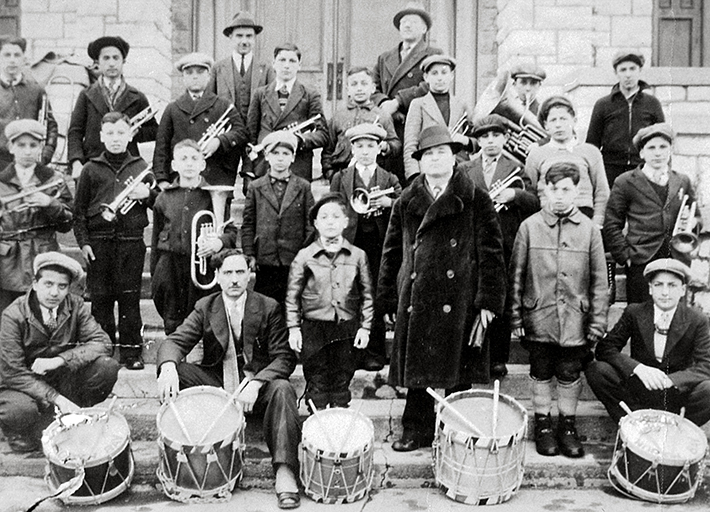 An early black and white photograph of the Italian boys band in North Bay, ON. The band is pictured without all their instruments or uniforms, which they would later wear. Photograph was taken on the steps of the cathedral. The group was founded in the early 1930s by music teacher and musician Nick Cangiano* -- third from the right, standing and wearing a fur coat. An accomplished amateur trumpeter, he made his living working for the railroad. Early band member Anthony De Marco is seated on the bottom far right with his kettle drum positioned in front of him. De Marco was involved with the band for several years. He remembers how active the band was, playing in local communities throughout the area, especially during celebrations. The band also played for church-related activities and events. Also pictured is Italo Gioia (top centre-right), who was involved with the organization of the band. A machinist with Canadian Pacific Railway, Gioia was an active member of the Italian Canadian community. He was arrested and interned for his involvement with the National Fascist Party and its branch in North Bay. It may be through him (and the fascio) that the band was supplied with instruments and uniforms. A note with a copy of this image (see below) indicates that the band was organized by the Figli di Colombo, which may be the same group as Societa Cristoforo Colombo pictured in LDICEA2012-0006-0005. It's unclear what, if any, relationship this group had with the local fascio. De Marco is not aware of the details. As a child, he notes they were happy enough to just play in the band. His father Carmine De Marco was also arrested and interned as a threat to the Canadian state. A copy of this image is in the collection (LICEA2012-0006-0007). It was donated to the Archives of Ontario by Antonia De Marco and has names identifying many of the band members written on its face. *Correction to the last name provided by family member Rene Pappone: "Nick Cangiano died in 1968, and was inducted into the North Bay Musicians and Entertainers Hall of Recognition in 2005."